Have you ever asked the Father for something big, something miraculous, and been so afraid that He might choose to say no that you avoid His presence altogether? I have. So you hide away, like the original sinners amongst the leaves in the garden, and when He calls, you cower because what if you don’t like what He has to say? What if you don’t have the courage to face what’s coming? Yeah, that was me a few years ago – no biblical courage to be found. You feel this yearning to give in and stumble to His arms, yet your stubborn heart resists with questions like why? and right now? Friend, have you ever felt like David before Goliath, wondering what happened to your army, praying for the courage to “fight the good fight” even if it means you’re doing it alone? And perhaps, like me, you feel more than a little lonely standing there with your simple “slingshot” in hand. Maybe you long for a superhero sidekick or two…or three. That’s the message our Father God gave me all year long during that difficult time. 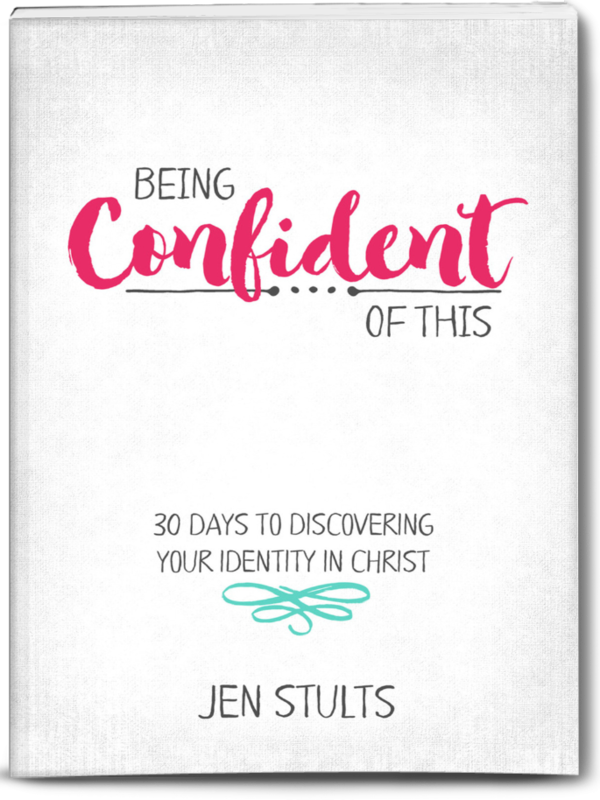 He sent it to me a million different ways – through a simulcast, bible study, a talk I was preparing for a MOPS group, prayer and quiet time, even through social media – you name the method, He’s used it. At first, I thought He meant the message for me in one specific area – that of pursuing writing and speaking. 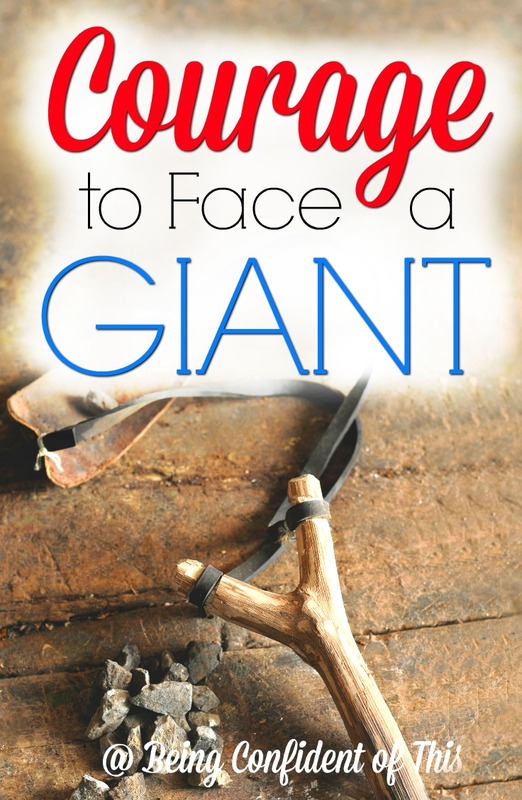 But after a while I began to see that the need for courage applied to so many other areas of my life – marriage, parenting, trusting God, finances, and especially … well, the potentially life-changing Giant we faced. Here’s the thing I’m learning about biblical courage, friends: it’s not supposed to come from me or you or any human source. A quick Old Testament search for the word courage reveals it is often used in connection with the phrase “be strong,” especially in the early years of Joshua’s leadership. Keep in mind that Joshua was new in his leadership role, and he had some big shoes to fill. I mean, who wants to follow Moses, the man with the burning bush experience and the credit of leading the Israelites out of slavery?! In addition, Joshua faced the enormous task of leading the people of Israel to conquer the Promised Land – hooray, right?! Well, sure that sounds good after wandering in the desert an extra forty years, but something many Christians don’t realize is the Promised Land wasn’t empty. No. The Promised Land was filled with “giants” and well-fortified cities. Joshua faced this very land. No more Moses to look up to and learn from. He was flying on his own set of wings now with a seemingly impossible task lying before him. I’m sure Joshua was afraid. I know he wasn’t completely confident he was up to the task. I’m positive because the Lord reassured him again and again in the first chapters of Joshua that He would be with Joshua. He commanded Joshua four times to “be strong and courageous” in the first chapter alone! And I’ve realized something about myself this year: I’ve taken the world’s view on Courage – you know, chin up, man up, just do it, what’s the worst that can happen, and all of the other sentiments we use to overcome our own fear. Maybe you have taken that view, too, without even realizing it. But that’s just not God’s view, my work-in-progress friends; that’s not what God tells Joshua. It’s not what He tells me or you, either. Consider this: when you look up the Hebrew for “strong and courageous,” you find both words or phrases (be strong, take courage) linked back to the Hebrew root chazaq (pronounced khaw-zak’). Previously, I wrote about that root, but I was more focused on waiting patiently. Angel armies going before Joshua as he led the Israelites in battle for the Promised Land. Don’t you see? The courage comes from Him, sisters! He doesn’t expect us to muster courage up within ourselves. He offers it from His very nature, for our taking! 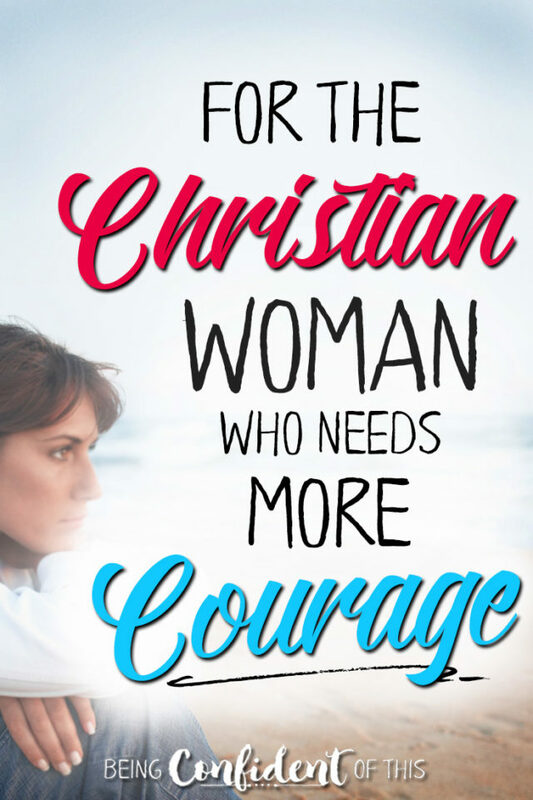 We can be courageous Christians because courage flows from our Father God. It’s true. We’re destined to succeed in whatever He wills for us when chazaq comes into play. So, I’m asking for some BIG things right now, Father. And I’m a little afraid, so I’ve been hiding out, avoiding your Presence. Hiding has only served to leave me feeling lonely and a little bit miserable. But like my friend Arabah Joy wrote, I’m asking for “rain” and I’m taking my umbrella with me. 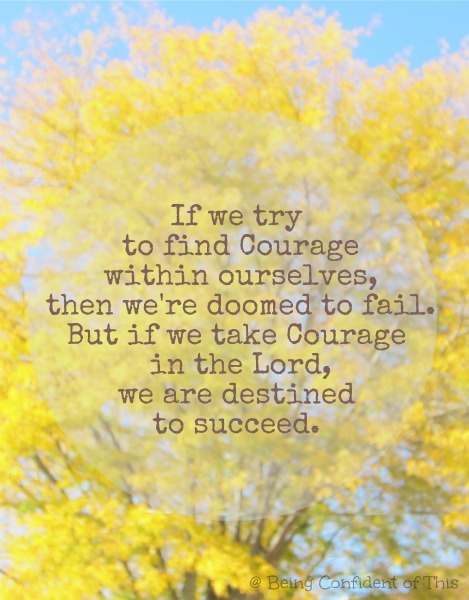 I know I’m lacking in the courage department right now and the fear seems to be winning a little bit. But I hear you say, “Courage, daughter,” and I know that means that You’ve got this. Chazaq – it’s Your Courage, not mine. It’s Your battle, not mine. Suddenly that giant doesn’t seem so big. And I’m crying, but I’m grinning, too, ‘cause I’ve missed you, Father. I’ve missed you. I hear Him whisper Courage to me, and to you, too, sister. If you’re interested in reading more about biblical courage, check out this article from Desiring God. Have you ever asked the Father for something big, something miraculous, and been so afraid that He might choose to say no that you avoid His presence altogether? 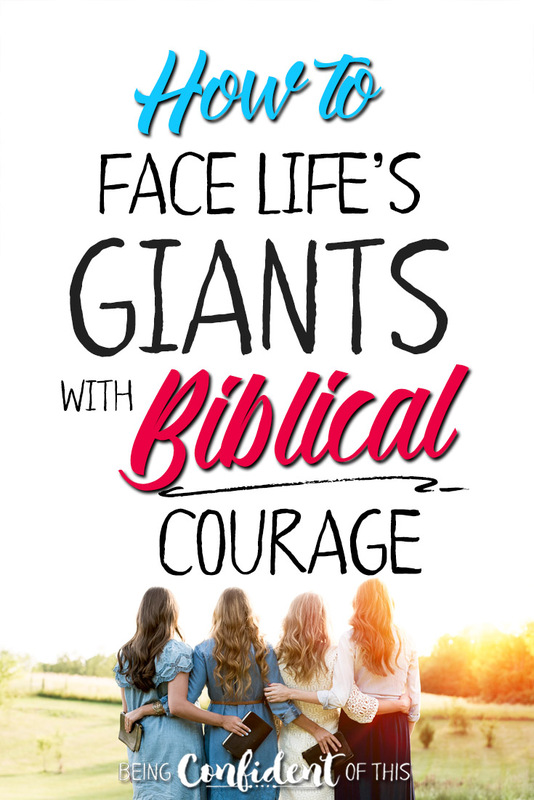 My sisters in Christ, have you ever felt like David before Goliath, wondering what happened to your army, praying for the courage to “fight the good fight” even if it means you’re doing it alone? And perhaps, like me, you feel more than a little lonely standing there with your simple slingshot in hand. Maybe you long for a superhero sidekick or two…or three. That’s the message I’ve been receiving from the Father all year long. He’s been sending it to me a million different ways. Through a Beth Moore simulcast. Through Bible Study. Through a talk He had me prepare for a MOPS group. Through prayer and quiet time. 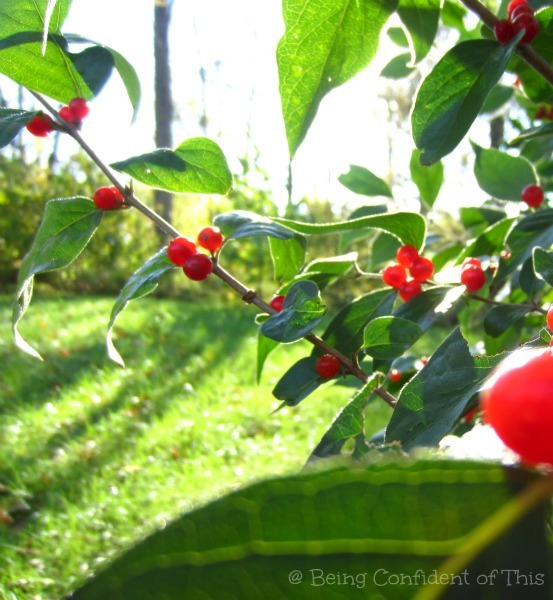 Through facebook posts and pintrest pins… you name the method – He’s used it. At times I’ve soared gloriously on that message, that promise. Other times I find myself a doubting Thomas, looking for evidence, asking for proof. At first, I thought He meant the message for me in one specific area – that of pursuing writing and speaking. 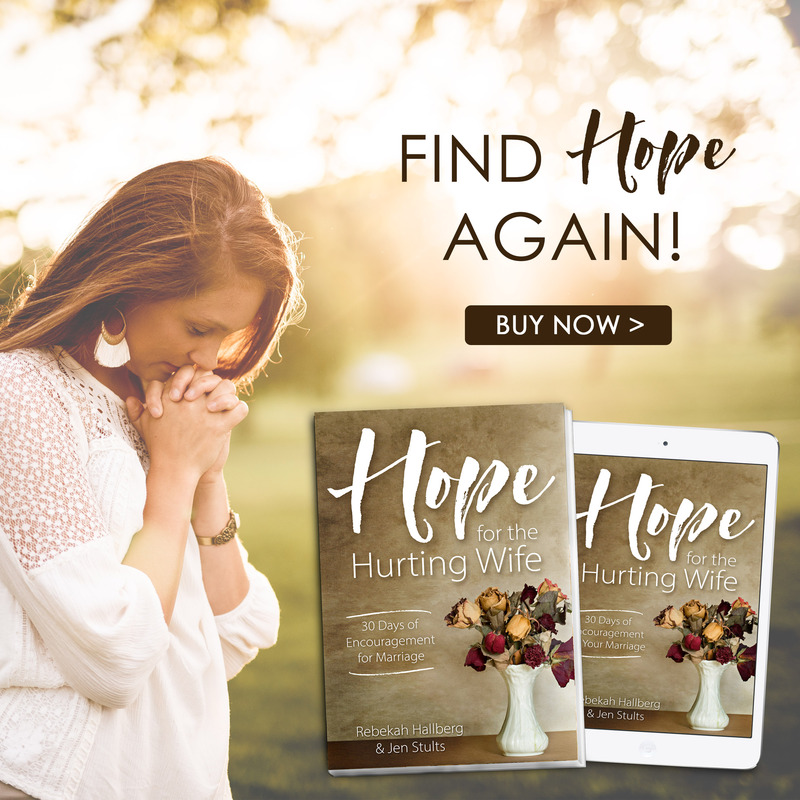 But after a while I began to see that Courage applies to so many other areas of my life – marriage, parenting, trusting God, finances, and lately… well, this potentially life-changing Giant. it’s not supposed to come from me or you or any human source. When you search for the word Courage in the Old Testament, you often find it used in connection with the phrase “be strong,” especially in the early years of Joshua’s leadership. Keep in mind that Joshua was new in his leadership role, and he had some big shoes to fill. I mean, who wants to follow Moses, the man with the burning bush experience and the credit of leading the Israelites out of slavery?! In addition, Joshua faced the enormous task of leading the people of Israel to conquer the Promised Land – hooray, right?! Well, sure that sounds good after wandering in the desert an extra forty years, but something I didn’t realize until this year is that the Promised Land wasn’t empty. The Promised Land was filled with “giants” and well-fortified cities. Joshua faced this very land. No more Moses to look up to and learn from. He was flying on his own set of wings now with a seemingly impossible task lying before him. I’m sure Joshua was afraid. I’m sure he wasn’t completely certain that he was up to the task. I’m positive because the Lord reassured him again and again in the first chapters of Joshua that He would be with Joshua. He commanded Joshua four times to “be strong and courageous” in the first chapter alone! And I’ve realized something about myself this year: I’ve taken the world’s view on Courage – you know, chin up, man up, just do it, what’s the worst that can happen, and all of the other sentiments we use to get past fear. But that’s just not God’s view, my sisters; that’s not what He’s telling Joshua. It’s not what He’s telling me or you, either. Because when you look up the Hebrew for “strong and courageous,” you find both words or phrases (be strong, take courage) linked back to the Hebrew root “chazaq” (pronounced khaw-zak’). Last year I wrote about that root, but I was more focused on waiting patiently. as in angel armies going before Joshua as he led the Israelites in battle for the Promised Land. It’s true. We’re destined to succeed in whatever He sets before us when “chazaq” comes into play. It’s Your battle, not mine. Suddenly that giant doesn’t seem so big. And I’m crying, but I’m grinning, too, ‘cause I’ve missed you, Father. Have I not commanded you? Be strong and courageous! Do not tremble or be dismayed, for the Lordyour God is with you wherever you go.